Rumor and Simon are beautiful ALC's and are what Domestic SBT Bengals are supposed to emulate... in their looks, but not their shy temperament. Asian Leopard Cats are shy, non-aggressive small rosetted felines, who most often "fish" for their food and have a fascination for water. Their shy temperament, coupled with their captivating wild look, is one of the reasons why they were chosen to create a new Domestic breed of feline. When the ALC is mixed with a Domestic Cat, you get the best of both - all in one Cat! Foundation Cats are actually MORE SOCIAL than SBT Bengals... but they are usually highly social with other Cats, rather than humans. The key with Foundation Cats is to give them the right start in life and then they bond with humans, as well as other Cats and dogs. At Santa Fe Bengal Cattery, we do all of the right things to make sure that our F2 and F3 Early Generation Foundation BENGAL Cats are irresistibly loving and attentive to humans. One thing to remember is that F1 Foundation Bengals are very different than F2 and F3's, as they have a much higher percentage of the ALC genetics... the F1's do not always make the best pets for most people... and can be difficult, even for experienced Breeders. They are not "wild," but they are more shy than what most want in a pet's personality and can sometimes have undesirable habbits. F1's can be expensive to buy and to keep, despite this... they can be right for some owners. However, we are happy to tell you that F2 and F3 Bengals will give you all of the beauty of the more wild-look, but not empty your wallet to buy or to keep. Read more about our Early Generation Foundation F2, F3, and True F4 Bengals. Keep Scrolling to see photos of Foundation Bengals! Santa Fe Bengal Magnificent Malbec is a magnificient House Cat and lives with his new owners. This is a F4 or later SBT Bengal, shown to the left. 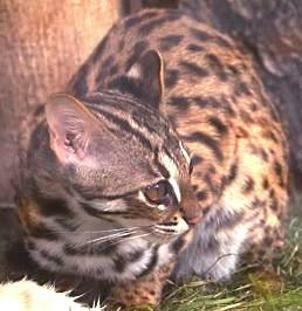 Domestic Bengals are four or more generations away from the first crossing with the wild Asian Leopard Cat. They have some of the wild look of the ALC and have dependable Domestic Cat temperaments. ...but keep reading and scroll down, because to show you an option to Fully domestic Bengals! Santa Fe Bengal Magnificent Malbec is an excellent example of a SBT Bengal Cat. are called F1, F2, and F3 - "F" is for "Filial". These Cats are very special, but may not be for everyone. However, they can make wonderful pets for the right Owners. the most perfect companion ever! Is a Foundation Cat right for you? If you meet one, you might just be hooked - we are! 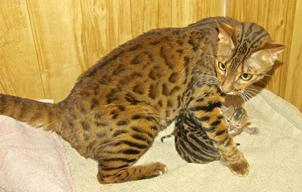 not just breeding Bengal Cats. meant for Breeding, are very different from the Neuter/spayed house pet. is far beyond what most Bengal Breeders are willing to do. All of this extra cost and time means BETTER BENGALS! who is truly breed standard... is priceless! with only the best Bengals. in the future, to approved Owners. We maintain that F1's are not the best choice for the average Bengal Owner. and can make excellent house pets. NOT required to have a special license to own one as they are not wild. without really having a wild Cat in your house! Click HERE for Foundation pricing. Scroll down and check out past examples of our Foundations. "Kipling" shown below is an F3 Bengal, who has amazing attributes. Look at his ears, then look again at the Asian Leopard Cats shown above... this is what we have been working towards in our Breeding Program for many years!!! We look forward to again offering Kittens like, Kipplings, in the future. Below, see photos of more of our other Past Foundation Cats. Click HERE to view more photos of all of our past Foundation Cats! Santa Fe Bengal Kipling is an outstanding F3 Foundation Bengal... he has a "House Cat" temperament, but the pelt, coloring, and the very, very rounded ears of a Wild Cat... we are very proud of the direction that our Breeding Program is taking!!! This boy is PERFECT!!! 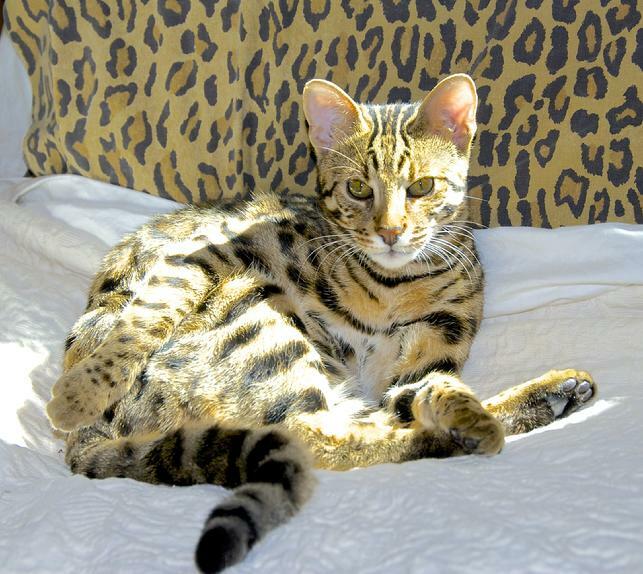 Santa Fe Bengal OfEiffel Proportion is a spectacular F3 girl with the perfect WILD look and a supercharged house Cat personality. Click HERE to find out more about Foundation Bengals and if they could be the right choice for you! This photo is used on a special edition Kitty Bloom label!!! I want to tell you how I appreciated reading your website. I have been trying to research the Bengals behavior/care to understand the foster kitten that I have. I have never owned or know anything about the Bengal breed, not too mention that she happens to be a F2. She is way more kitten then I am use to! She is a Kitten rescued from another owner and is only just six months old. You would be amazed at how many sites I went to and found nothing other then purchasing a kitten or a retired adult. Most sites said just feed your Bengal kitten normal cat food and said nothing for Foundation cats. I knew they needed more protein, but nothing stated exactly what to do... like your web site does. Your web site has been a huge help. Thank you again! Tammy Liebenthal, Wisconsin"
Thanks Tammy! We are glad that you found such useful information on our 100-plus pages of easy to navigate facts and advice regarding Bengals... actually, we do intend for our site to be a public information resource for Bengals and for all feline breeds, as well as promoting our Cattery and creating an easy-to-view venue for the public to see our available Kittens.